The Institution of Engineers (India) (IEI) is in the Service of Engineering Profession and Engineering Community since 1920. The visionaries amongst the engineers thought it necessary in the early twentieth century to establish in India a professional society encompassing all disciplines of engineers. The sapling planted in the 1920 has, by now, grown to a big tree and the track record of The Institution of Engineers ( India) has been a matter of pride for all engineers. In the second decade of the last century India was embarking on industrialization. A report of the Industrial Commission in 1916 recognized the importance of the engineering profession. Proposals were mooted in 1918-19 for the formation of an Indian Society of Engineers. Finally the Institution of Engineers (India) was formed and registered at Madras in 1920. Sir Thomas Holland was one of the active participants leading to the establishment of the Institution and could be considered as its founder. The IEI was registered under the Indian Companies Act, 1913in the year 1920 and was formally inaugurated in 1921 by Lord Chelmsford, the then Viceroy and Governor General of India. The Institution of Engineers (India) was granted the Royal Charter of Incorporation 1935 by His Majesty the King George V of England in 1935, “to promote and advance the science, practice and business of engineering in all its branches in India”. Starting with this humble beginning, The IEI is now an unique professional body encompassing 15 engineering disciplines and with an overall membership of over 0.5 million. The IEI is the first professional body to represent India in several International Bodies, such as the World Mining Congress (WMC), the World Federation of Engineering Organizations (WFEO), the Commonwealth Engineers’ Council (CEC), the Federation Internationale du Beton (fib), and the Federation of Engineering Institutions of South and Central Asia (FEISCA). 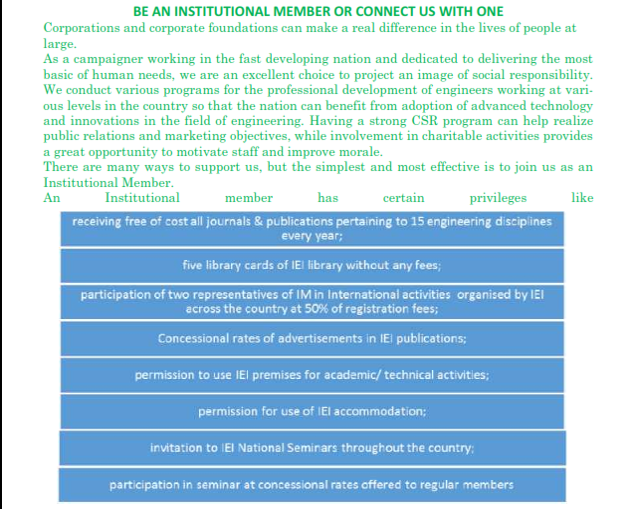 It also has bilateral agreements with a number of professional societies across the globe. The IEI functions with and amongst the professional engineers, academicians and research workers and provides a vast array of technical, professional and supporting services to the government and the industries along with the academic and engineering communities. The IEI is the pioneer body to introduce, starting from 1928, non-formal engineering education programme, successful completion of which is recognized as equivalent to a degree in engineering by the Government of India, the Union Public Service Commission, the State Governments and many Public / Private Sector organizations in the country. The IEI, with its headquarters in Kolkata, India, is administered by a National Council with the President as its Head, and operates through 94 State and Local Centres, located at capital cities and towns of industrial and academic importance all over the country, and five Overseas Chapters. The Secretary and Director General is the Chief Executive of the Institution. How does the Institution serve the Engineering Community ? Recording appreciation of and extending recognition to individual achievements and activities in advancing the art and science of engineering and technology. Largest non-formal engineering educator in the country with government recognition for AMIE examination. The Gujarat State Center of the Institution of Engineers was established in the year 1961 upon formation of Gujarat state in that year.The Gujarat State Centre has more than 34000 Corporate and Non-Corporate Members on its rolls. The center has its own building known as Bhaikaka Bhavan named after the reputed engineer of Gujarat Shri Bhailalbhai Patel. The building includes an auditorium having capacity to house 275 participants. The Gujarat State Centre has also built up a good Library with about fourteen thousand books including ISI standards. At present there are four Local Centres at Surat, Vadodara, Vallabh Vidhyanagar and Rajkot (Saurashtra) which are attached to the Gujarat State Centre.